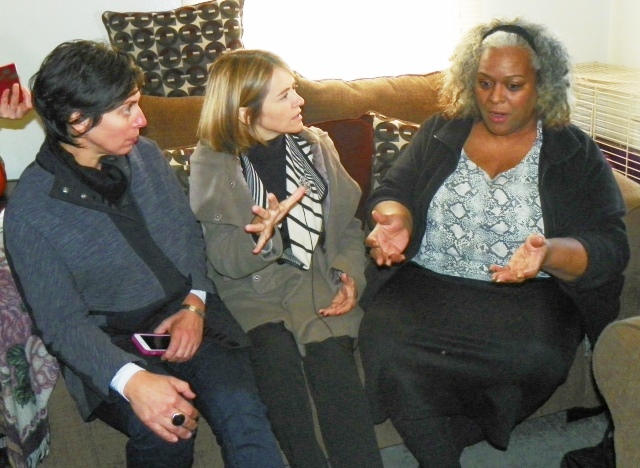 UN Rapporteurs Catarina de Albuquerque (speaking) and Leilani Farha (to her left) interview east side Detroit resident about her experience with water shut-offs Oct. 19, 2014. 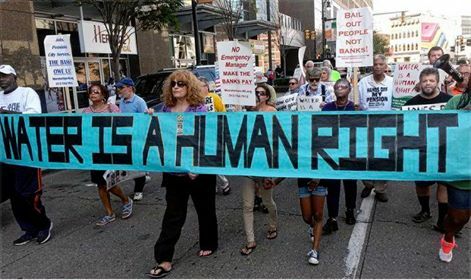 Residents who spoke with United Nations rapporteurs Catarina de Albuquerque and Leilani Farha about water shut-offs, during their visit to Detroit last weekend, painted a devastating picture of mass inhumanity directed at the poor and mostly Black population of Detroit. Rapporteurs speak with Rochelle McCaskill in her home. 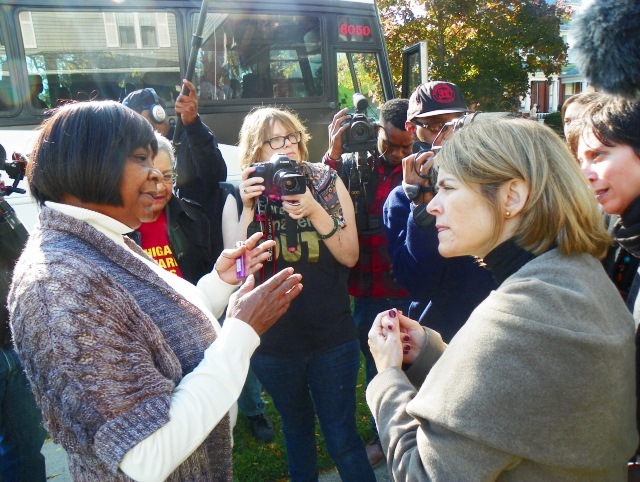 During a bus tour Oct. 19, Rochelle McCaskill invited the representatives into her east-side home, where she, three daughters, and a grandbaby live. McCaskill said she suffers from MRSA, a contagious antibiotic-resilient infection that causes sores and boils and can become life-threatening. It is becoming more common in communities, although it originated in hospitals, nursing homes, prisons, and other institutions where people reside in close quarters. Valerie Burris, who assisted McCaskill, points out blue “mark of shame” left on sidewalks where water is slated to be shut off. McCaskill said she must bathe three times a day and frequently wash her clothing to prevent infecting her loved ones. She said she almost died from sepsis last year. Valerie Burris, who referred McCaskill for assistance, pointed out the blue mark on McCaskill’s sidewalk, that water contractors use to designate homes set for shut-offs. 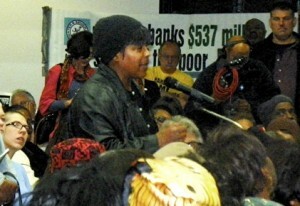 Calvert resident speaks to rapporteurs and bus occupants. Tour guides Cecily McClellan, who lives on Detroit’s near west side, and Valerie Jean, who stays nearby on the east side of Woodward, described massive housing problems in addition to the water shut-offs. McClellan said the city is selling 6,000 foreclosed homes at once in “blight bundles,” for which the minimum bid is $1 million. The bus toured Calvert and Glynn Streets, an area of stately solidly-built homes. 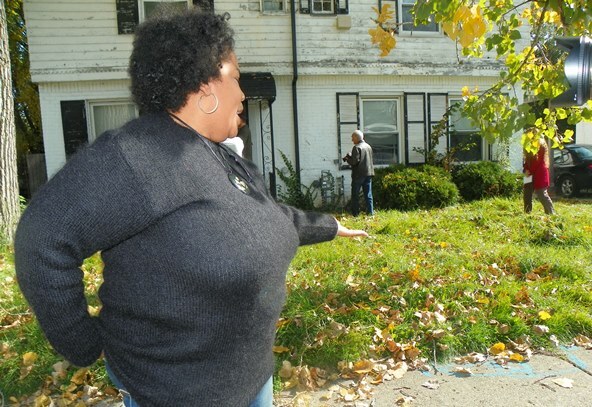 “They’re knocking houses down on these streets which can be repaired,” she said, pointing to various vacant lots. “That what the Detroit Futures Project on Glynn Court is for. They refurbished one home with public money for $532,000, then sold it to a white professor for $80,000 who was moving back from Oregon.” She said many foreclosed homes are being sold to whites, and include payment forgiveness arrangements. 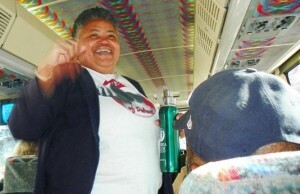 Valerie Jean directed the bus down Woodland, where she lives. Jean, who has three children, ran a water contractor from Homrich away when he came to her home, but said he still succeeded in shutting water off to every home within three blocks. She said she has set up a water station in her front yard, where residents can get water and food, since they can’t cook without water. 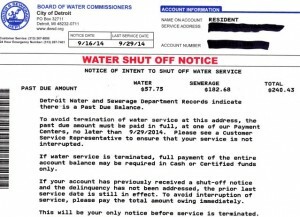 Water shut-off notice shows large discrepancy between sewerage and water charges, to penalize poor Detroiters for delinquencies. 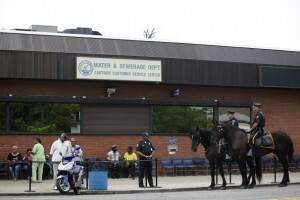 During the Kwame Kilpatrick administration, suburban interests who wanted the water department pressured the city into an agreement that Detroit residents would be disproportionately charged for sewerage, because their rate of delinquent payments was higher. 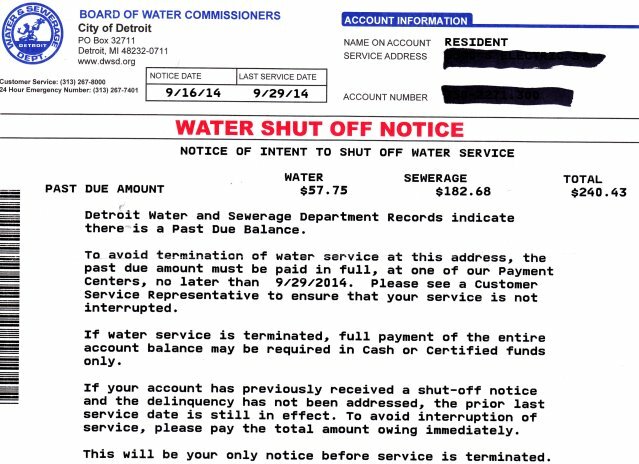 Published reports indicate that spikes in Detroiters’ water bills in recent months occurred because the department neglected to charge the discriminatory sewerage rate to all Detroit residents earlier. Marian Kramer, a Highland Park resident and leader of the Michigan Welfare Rights Organization, along with another Highland Park resident, said that under Detroit’s bankruptcy plan to regionalize the water department, Highland Park’s system is being merged into DWSD. Now residents of Highland Park, a city within the boundaries of Detroit, get TWO water bills a month, one from each agency. They said most Highland Park residents are senior citizens living on fixed incomes who can’t afford to pay. 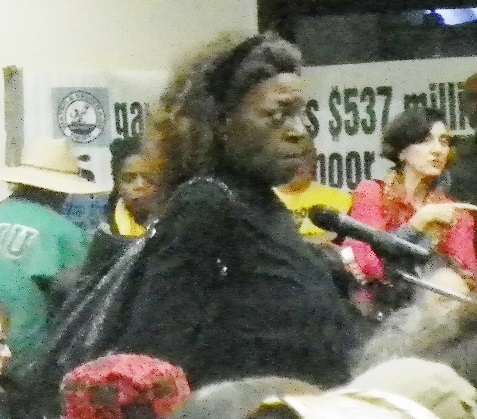 Detroiter explains travails with water bills to UN delegates. A resident of the Sherwood/Seven Mile neighborhood with three children said her water was shut off with no warning notice and without even a knock on the door. “They knew there were children here,” she said, pointing to kids’ chairs on her porch. Organizer Russ Bellant, who also lives in the neighborhood, said a total of 11 homes had their water shut off that day, and that there are 60 vacant foreclosed homes in the area. Ten were demolished within a couple of months, he said. Massive crowd at Wayne County Community College applauds the UN delegates Oct. 19, 2014. Long-time activist Gwendolyn Gaines is in center in MWRO shirt. Later that day, at least 600 people packed the auditorium at Wayne County Community College’s downtown campus to address the UN rapporteurs, as well as a panel of community leaders. 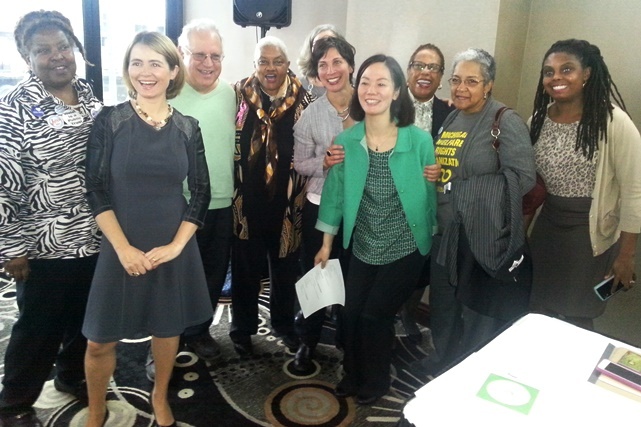 The sponsors of the tour and meeting included MWRO, the Michigan ACLU, the Moratorium NOW! Coalition, the People’s Water Board, AFSCME Local 207, Detroit Active and Retired Employees Association, Food and Water Watch, the Detroit School Board in Exile, Michigan Human Rights Coalition, St. Peters Ecumenical Church, and many others. Rapporteurs introduce themselves to panel and audience. Prof. Charles Simmons second from right. Speaker after speaker testified about the suffering Simmons referred to. He said those who lose their homes go to shelters or remain in the homes with no utilities, while the state cuts off assistance to the families, who no longer have valid addresses. Nicole Hill said her water bill is now $6,000. She testified that her water was recently shut off from May 15 to July 14, 2014, on top of previous water shut-offs in the past. Her first shut-off was in May, 2011. On October 7 of this year, she said, after a brief respite during Detroit bankruptcy proceedings, they shut it off again. She said the department is steadily cutting off others in her neighborhood as well, at one point shutting off a whole block. Another woman testified that her water bill went up $600 in one month because she allowed neighbors whose water had been shut off to come to her house to get that necessity of life. Others testified about having elders and children in their homes when their water was shut off, and about being forced to go to suburban Wyandotte for water assistance since the shutdown of the Detroit’s Human Services Department and the dismantling of the Water Affordability Program. Demeeko Williams of the Detroit Water Project said the ‘entire system is to blame for the savage water shut-offs in Detroit. In 200 days, according to Mayor Mike Duggan and representatives from Wayne, Oakland and Macomb Counties, they expect to have the “Great Lakes Water Authority” in place, pursuant to the Detroit bankruptcy. U.S. Bankruptcy Judge Steven Rhodes has said he plans to announce whether he will confirm the bankruptcy plan in two weeks. Any negotiation or agreement reached now with DWSD and the UN would be null and void under that plan anyway. Sharon Moore said her 80-year-old mother’s water bill has increased 100 percent every month, while water is running down the street from a nearby abandoned building. John Rakolta, CEO of Walbridge Aldinger, a major DWSD contractor and a major contributor to Gov. Rick Snyder’s campaign. A single mother with three children said she would not allow the water department to install a remote meter because of possible negative health effects, which have been broadly publicized, so they shut her water off. She said she finally allowed them to install the meter but is still plagued by payment problems. The meters are being installed under a four-year $153 million contract with Detroit Meter Partners, comprised of Walbridge-Aldinger and Weiss Construction. Customers are forced to pay large installation fees. 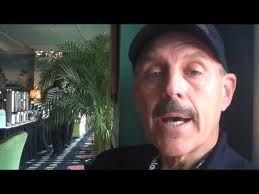 Walbridge CEO John Rakolta is a top campaign supporter of Gov. John Engler, for whom his daughter also works. He has also been involved in the Detroit schools takeover. Police on watch outside Water Affordability Fair. 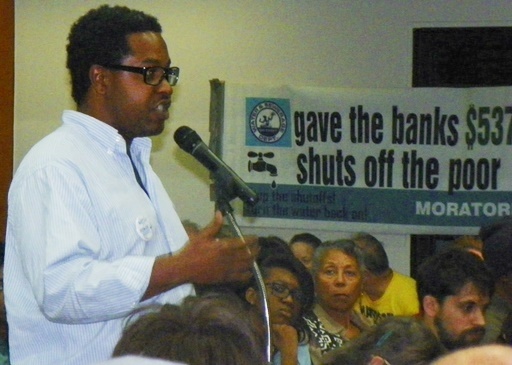 McCray, along with several people who wanted to speak on behalf of indigenous people, was cut short, while others were refused access to the microphone by some conference organizers, who said they wanted to focus only on water and foreclosures. “Indigenous peoples have the right, without discrimination, to the improvement of their economic and social conditions, including, inter alia, in the areas of education, employment, vocational training and retraining, housing, sanitation, health and social security. 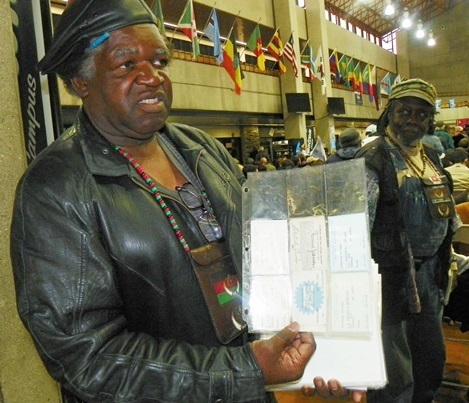 Richard Johnson El-Bey, with fellow Moor, shows his skilled trades licenses. Although Johnson El-Bey has African looks, Native American tribes for many centuries accepted tens of thousands of kidnapped Africans (“slaves”) into their lands and intermarried. A large proportion of “African-Americans” today have indigenous blood. Council Pres. Brenda Jones speaks about DWSD 10-point plan, with Mayor Mike Duggan at far right, and his chief of staff Alexis Wiley at left. DETROIT — After meeting with Detroit Mayor Mike Duggan and City Council members in a closed session the morning of Oct. 22, representatives of the UN Office of the High Commission for human rights roundly denounced conditions faced by Detroit’s majority population, and expressed disappointment with City plans to remedy them. “This is a man-made Perfect Storm,” said Catarina De Albuquerque, the first UN Special Rapporteur on the right to safe drinking water and sanitation. She is also a Professor of Law at the Universities of Brage, Coimbra and the American University’s Washington College of Law, and a senior legal advisor at the UN Prosecutor General’s office. 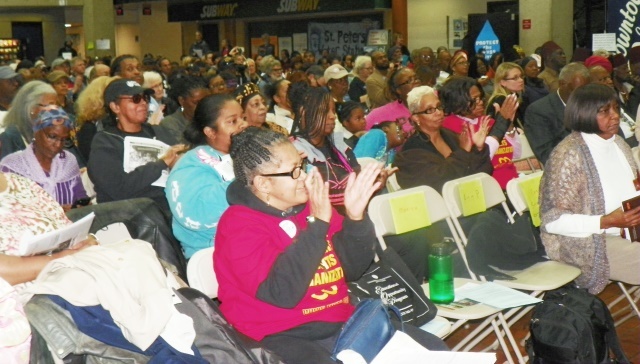 She called the shut-offs “the most extensive” in the U.S.
UN rapporteurs receive testimony from packed Wayne County College Auditorium of Detroit residents on how water shut-offs are affecting them. In the United Kingdom and other countries, water shut-offs are barred by law due to public health concerns. She noted the U.S. has ratified the Universal Declaration of Human Rights, which includes the right to life and security of the person, the provision of housing and water in a non-discriminatory fashion, and the elimination of racial discrimination. 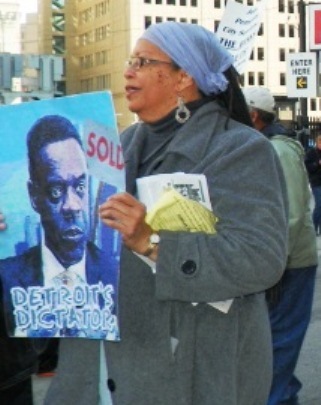 Downtown Detroit rally against water shut-offs. She said disconnection of water services is only acceptable if it can be shown that the resident can pay. Leilani Farha is the UN Special Rapporteur on adequate housing as a component of the right to an adequate standard of living, and the right to non-discrimination in this area. 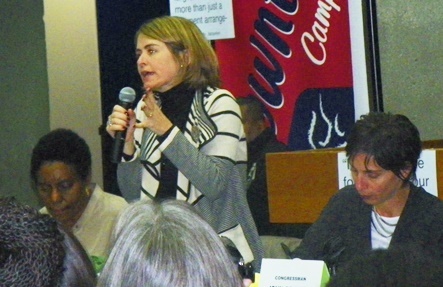 She is also a lawyer and Executive Director of the NGO Canada Without Poverty. 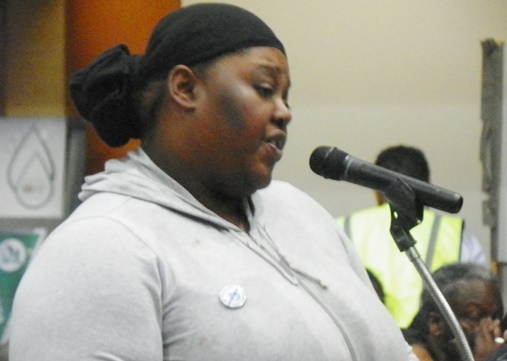 Detroit woman testifies angrily about her experiences with DWSD during WCCC town hall meeting. 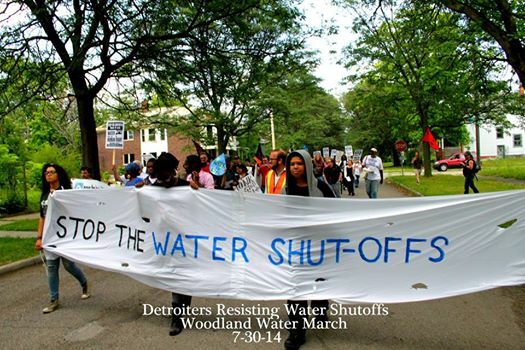 The City of Detroit must restore water connections to all residences and neighborhoods. Stop any further disconnections to those who are unable to pay. We urge the city, state and federal government to adopt mandatory affordability standards. Special policies must be set up to ensure these measures are tailored to the needs of the people. Authorities must make an urgent assessment of public health consequences of the water shut-offs. Appropriate investments must be made to determine if there is a disproportionate impact on people of color. For the homeless, the City of Detroit must take urgent steps to ensure they are housed with adequate supplies of water. 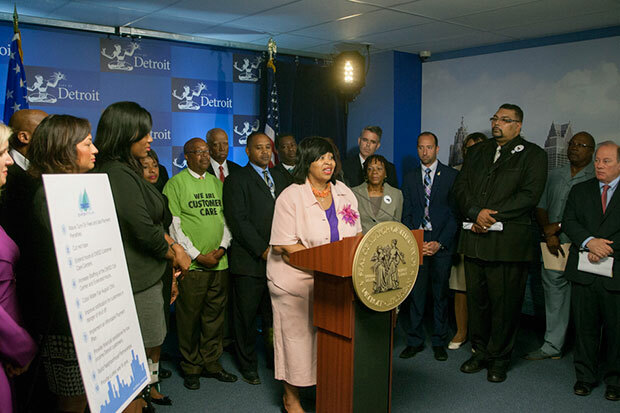 Residents should be ensured of access to administrative and legal remedies to challenge shut-offs if they are unable to pay, the amounts of their bills, and the affordability of water in the City of Detroit. Newscaster Paula Tutman asked the rapporteurs in an unusually strident fashion how the city would be able to afford water services if people don’t pay their bills. The Rapporteurs cautioned that international law such as that embodied in numerous UN instruments is also about national law. They said that international human rights law should be incorporated in every policy, every program, every human rights condition. They said they will bring their findings to the attention of the U.S. representative to the UN, Susan Rice. Bankruptcy protest at Federal Courthouse April 1, 2014. 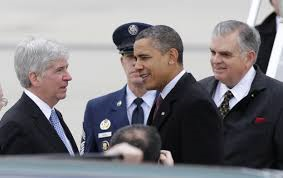 Tangela Harris asked, “How do citizens stand up when democracy is not standing up for them?” She obviously referred to Michigan Emergency Manager law, which has disenfranchised at least 51 percent of Black residents in the state. It was not clear if the UN Rapporteurs had been adequately briefed on this issue. Through his chief of staff, Alexis Wiley, Mayor Duggan expressed disappointment and scorn towards the UN Rapporteurs’ efforts, after meeting with them for 90 minutes that morning. 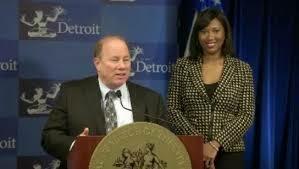 Mayor Mike Duggan and chief of staff Alexis Wiley, a former newscaster. “It’s disappointing but it’s kind of scary that you can have such a heavy name of the United Nations — that is such a responsibility — and to not live up to that responsibility, to come really without an interest in information,” Wiley said in published reports. “No one’s saying we’re perfect. But if you want to work together, let’s work together and make sure policy is built on facts. It’s not built on an agenda. The UN formal press release, “Detroit’s water shut-offs target the poor, vulnerable, and African-Americans,” is available at UN Detroit water report . It includes phone numbers, email addresses, websites, and social media connections for UN Human Rights agencies. The City’s “10-point Plan,” which does not guarantee affordability or bar shut0ffs, is at Detroit Water and Sewerage Department 10 point Plan. U.S. Bankruptcy Judge Steven Rhodes declared this plan adequate and said he had no power to ensure affordable water anyway. He is expected to announce his decision on confirmation of the bankruptcy Plan of Adjustment, which includes the elimination of the Detroit Water & Sewerage Department, and its replacement by the regional Great Lakes Water Authority, next week. NOW they are cutting off water even to those paying their bills. They are demanding we have a new water meter installed or they will cut off our water…we pay about $200.00 per month ON TIME every month..
There’s a missing angle on most of the affordability issues we’re facing – water, property, good food, and more. What is missing is mass transit’s role in providing for the human need to have mobility. 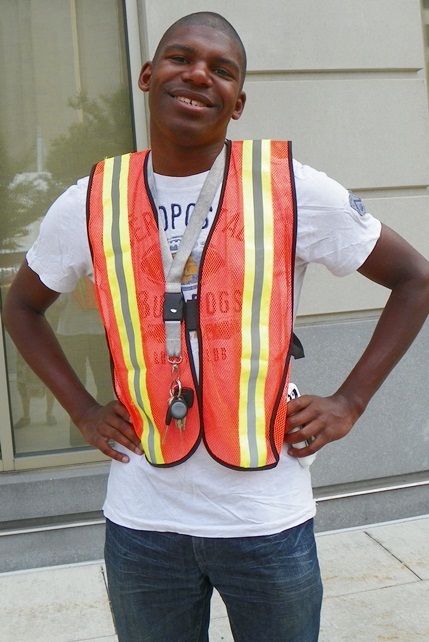 That mobility is required due to the lack of jobs within the city, most basic wage jobs existing in the suburbs and many are outside the 9-5 standard hours. Mayor Duggan spoke of “give me six months to fix the buses”. What we have now after nine months amounts has increased the police-state around mass transit. That doesn’t address the irritability of riders, or drivers. The only way for these to be addressed is to return to 24 hour bus service. The FTA funds coming in to put 25 more buses on the roads; must also include hire drivers, and most important hire mechanics to keep the buses ready for service. The traffic flow of the buses needs reviewed to determine where people in the most need are being serviced. Often in the sprawl of sparse population that will require pickups and drop offs that are outside densely populated areas. These are in many senses the most difficult to service. The objective for increased mass transit is to enable JOBS and AFFORDABILITY through MOBILITY. These are crucial elements that haven’t been being conveyed in the list of demands the movement is bringing forward. If I was to venture into why these don’t show up – it is likely because those writing the demands don’t live within the condition of those in the most need. Privileged activists need to comprehend where their privilege lies and listen closely. If we are striving for equality – then we must address the least common denominator, and that would be the poorest of the poor: being homeless with various physical and mental conditions. We have to hear and speak with those whom are being tread upon the most by oppression.